This recipe turned out to be a real winner. I was actually pretty surprised that you could make a dish like this in the crock pot. Honestly, I thought it would turn to mush. Surprisingly, it did fantastic. I guess if you left it in the crock pot for WAY too long, it would have the potential to mush but after it was done cooking, I put it on the “warm” setting of my slow cooker and it kept in great shape until we were all ready to dig in. 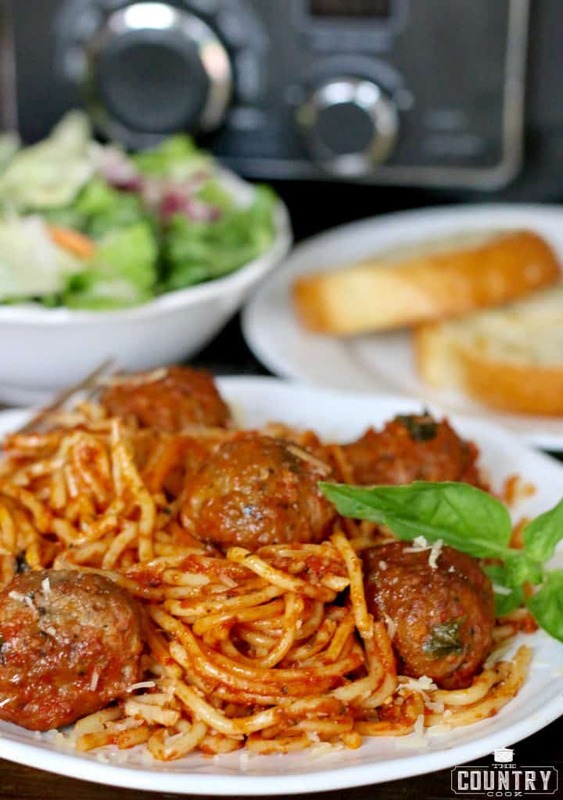 Serve this up with a bagged salad and some Texas Toast garlic bread and you have a seriously simple but yummy meal your whole family will absolutely love! 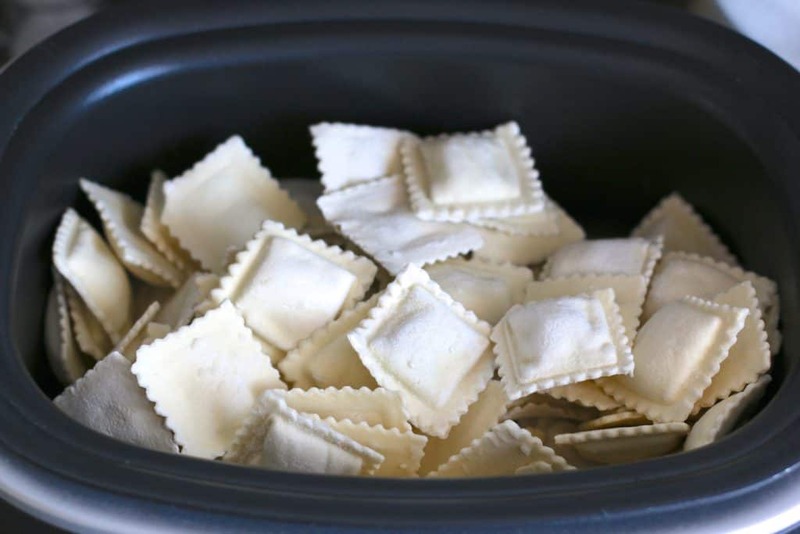 *Cook’s Notes: If you have a smaller family or just don’t want leftovers, one bag of ravioli will work. Keep the sauce recipe the same. I used a mix of beef and cheese ravioli. Water and mozzarella cheese not pictured here. Also, you can substitute sauce ingredients for one large jar of store-bought pasta sauce. 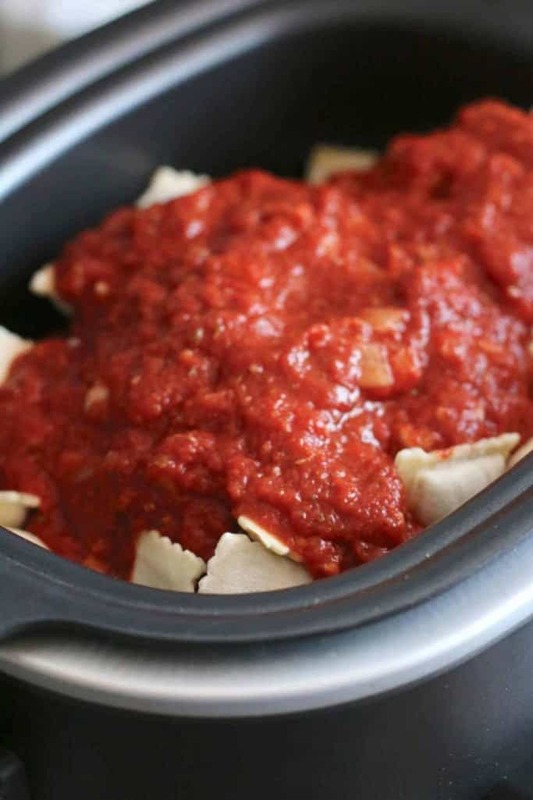 Pour the frozen ravioli into a 6-quart slow cooker. 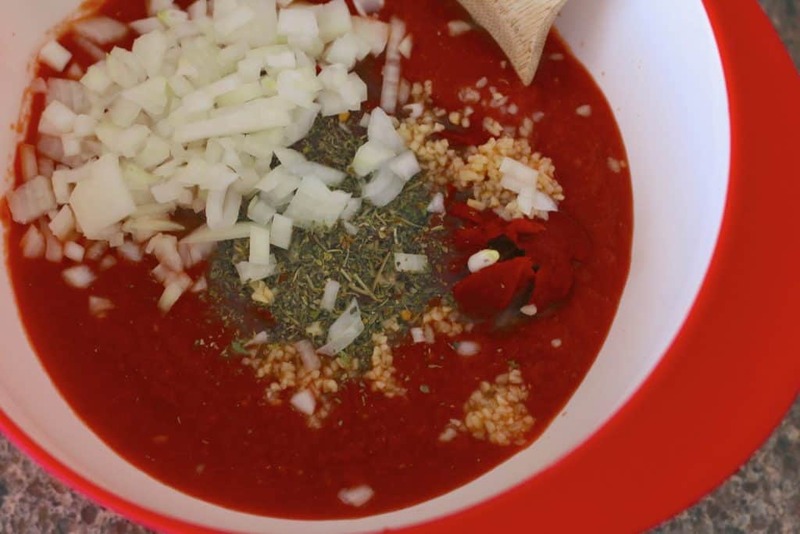 In a medium bowl, stir together the crushed tomatoes, tomato paste, water, onion, minced garlic, Italian seasoning and salt & pepper. Pour sauce over the frozen ravioli and stir to coat all the ravioli with sauce. Cover and cook on low for about 5 hours (or high for 3 hours.) There is no need to stir this while it cooks. About 10 minutes before serving, sprinkle the ravioli with the shredded mozzarella cheese. 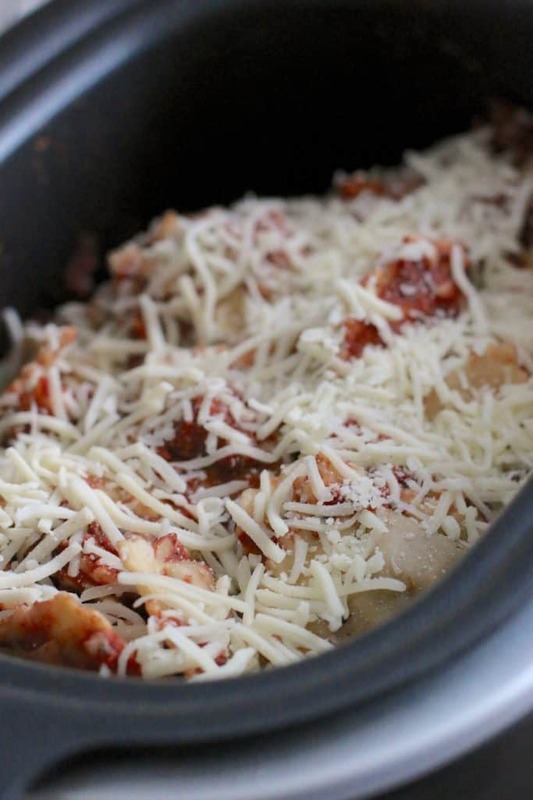 Place the cover back on the slow cooker and let the cheese melt. Then serve with a fresh garden salad and maybe some garlic bread – yum! 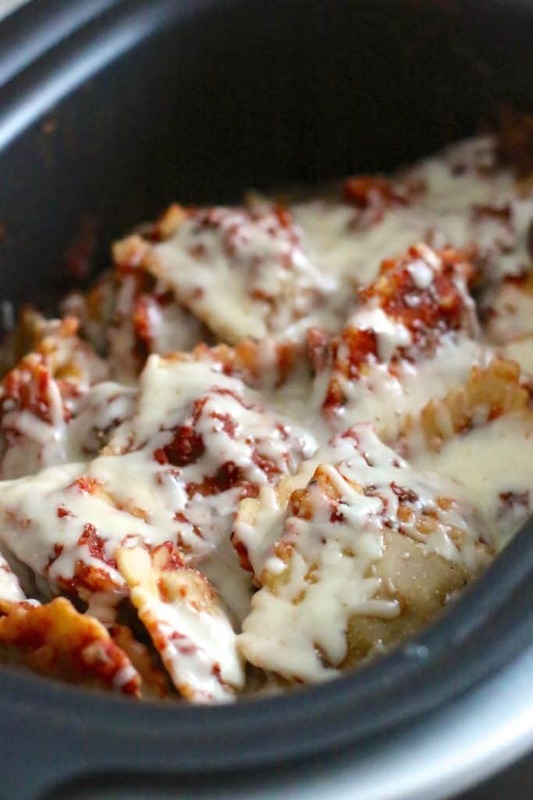 Crock Pot Ravioli recipe uses frozen ravioli with a quick homemade sauce and lots of gooey mozzarella cheese. Perfect all-in-one meal! Cover and cook on low for about 5 hours (or high for 3 hours). There is no need to stir this while it cooks. 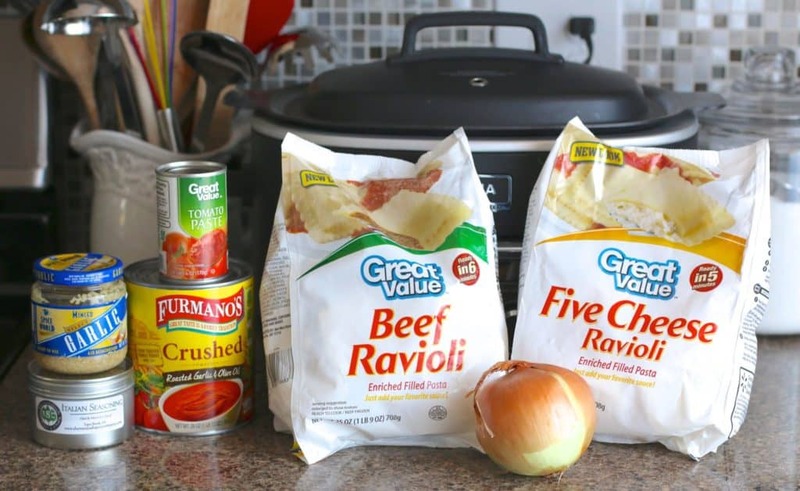 If you have a smaller family or just don't want leftovers, one bag of ravioli will work. Keep the sauce recipe the same. I used a mix of beef and cheese ravioli. Also, you can substitute sauce ingredients for one large jar of store-bought pasta sauce. 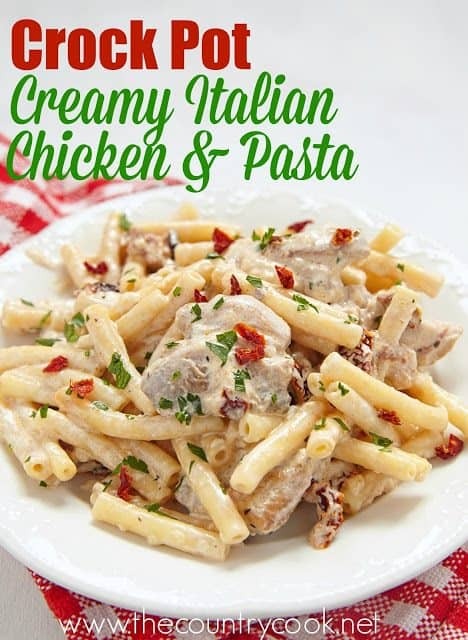 Great served with a salad and garlic bread. Hi Brandie, how do you like your ninja cooker? I want to order one it looks awesome! oh my goodness Brandie, this looks fantastic! I can't wait to try this one on the family. Thanks Brandie and Rachel for the replies back on this cooker. I saw it on QVC and ready to get it!! 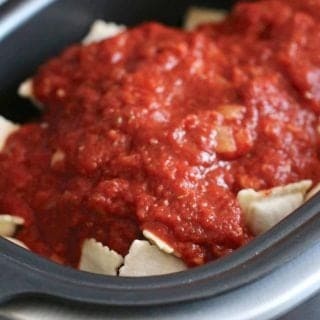 Oh and I tried your Ravioli recipe yesterday in my regular slow cooker and it came out awesome! I just used 1 package of Ravioli and a jar of spaghetti sauce, It was Delicious! 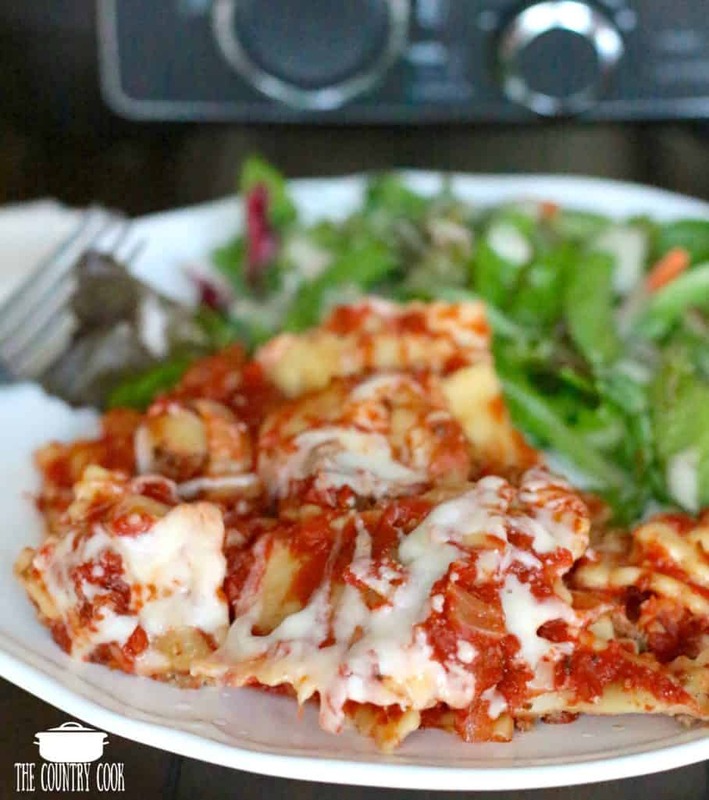 I've always found that slow cooking pasta makes it too soft and mushy, so I LOVE the idea of using frozen pasta! I bet that solves the whole problem! 🙂 this looks yummy! I have a Ninja cooker too and I LOVE it! Bought it at Bed Bath & Beyond with a 20% off coupon!! 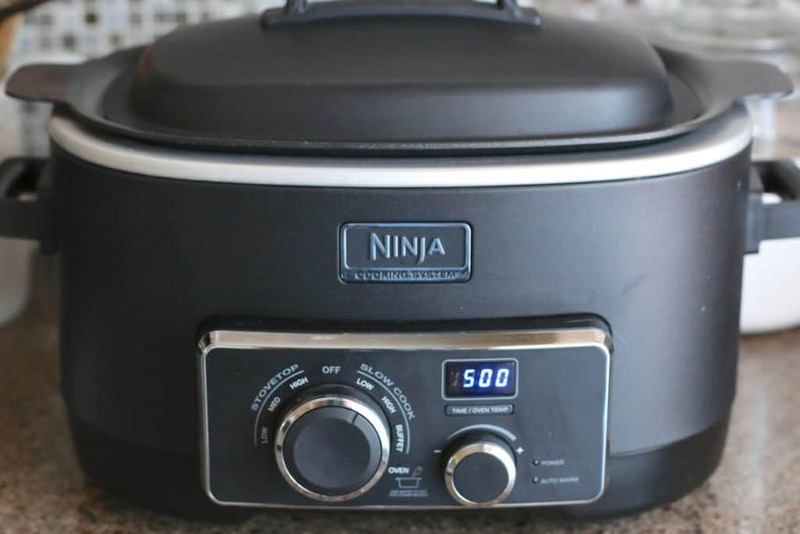 Ninja cooker now only $99 @ Walmart! How many servings is this recipe? Tnx! This recipe sounds awesome and making it now. Had nothing in the house to make for dinner but did have ravioles and the rest. I browned some ground sausage and threw that in crock pot with the sauce. Can't wait to try it. Thanks so much! If you're using store bought sauce, do you still add water? This is delicious. Have made it several times and added some red wine instead of the water! I wanted to let others know about the Ninja cooker. After lots of research, I decided this was the one I wanted. I put it on my Christmas list and my daughter was kind enough to purchase it for me. I have to say, it is by far the best cooking system I have ever had. It cooks evenly, saves time and energy ( no need to dirty every pot, it can be done in just the Ninja and the foods taste fantastic. I make my spaghetti in this and it's perfect – every time! Clean up is a breeze – nothing has ever gotten burned or stuck. You could just wipe it with a paper towel, it's that easy. If you are thinking about it, I highly recommend you go for it. It's been two years since I received mine and I use it all most every day. 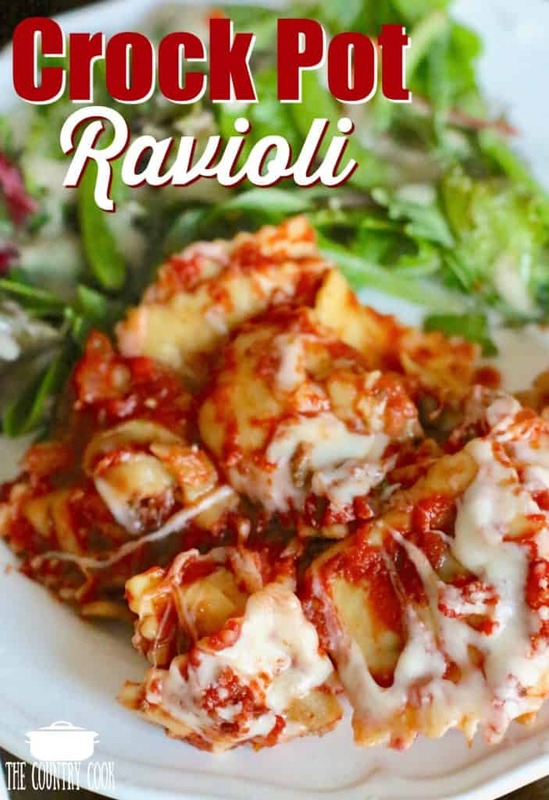 I have not tried the ravioli, but I know it will be just as fantastic as the spaghetti. I'm definitely trying this recipe and will be using the one bag as there's just the two of us here to eat it. I want to say that I've had my Ninja for two years. I wish I had bought it sooner. 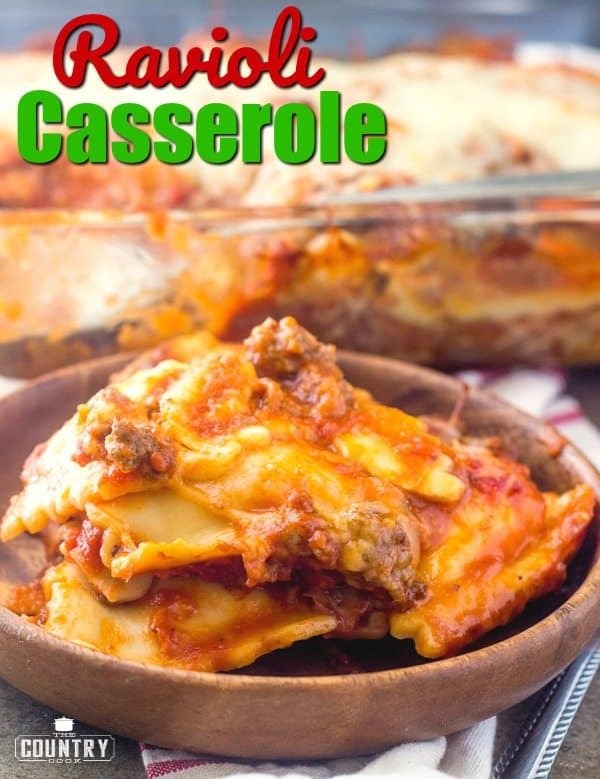 It's my most favorite go to slow cooker for large recipes. One pot cooking – it does everything!!! I sometimes use it 3 or 4 times in one week…I have a 3 1/2 quart Cuisinart, which I bought around the same time as the Ninja. It's my go to for smaller recipes. Cooks wonderfully!! They both have the keep warm option, which I love a lot. It automatically turns on when the done time is reached and will stay on for up to 8 hours. Both clean up like a breeze…. Can this recipe be done on the warm setting for 8 to 10 hours? I work that long and don’t have anyone home to turn it off after 5 hrs. I think my family would love it. Happened upon your site while looking for easy recipes to make for my son-in-law and granddaughter since my daughter seems to have caught the awful “fake flu” making the rounds in our area. She has made something like this before and the family liked it. I would imagine leftovers (if there are any) would heat up well. Anyone have experience with that? Thank you for the recipe. It will be a big help! What size bag of ravioli do you use? Thank you. I’m in Canada and didn’t recognize the ravioli from the picture. Hi, what size jar of store bought sauce ?